Florence is situated in the aesthetically pleasing backdrop of the Tuscan Mountain ranges in Europe and has extravagant mountaineering getaways to brag about. That however, takes nothing away from the fact that it has a huge cultural and artistic tradition and is full of majestic palaces, wonderful museums and overpowering landmarks. For those of you wanting to get away from the mountains, book one of our car rental services and we’ll take you around downtown Florence in all its glory. The Uffizi museum is perhaps the most popular downtown attraction in Florence. It mostly houses Renaissance painting and masterpieces by Sandro Botticelli and Donatello amongst others. Sculptures by Michelangelo and Antonio Rossellino occupy prominent places in this gigantic museum. The cafes and plazas in the museum have a delectable buffet spread. Located towards the Southern stretch of the city along the banks of the serene Arno, the Pitti Palace houses the Royal family of Medici and their exhibits. What attracts most tourists to this place are the beautiful views of the city and the splendid gardens adorning the palace. With our super car hire services, you can visit all the palaces of the city with ease. This place is a Mecca for science enthusiasts primarily because the instruments and diaries of Galileo are located here. This museum caters to engineering lovers all over the world and has several parlours dedicated to the technical branches of science and technology. Kids will love the exhibits here and it is a great day out for all the family. Built in early 1300s, the majestic Baptistery in Florence is famous for its bronze doors and marvellous mosaic paintings on the ceilings. This parlour is a must visit place in Florence and offers scenic pathways that lead to the mountain ranges. The Piazzelle Michelangelo, or The Michelangelo Square is situated at a height of more than 50 metres and can offer breath-taking views of the Florence skyline, more so the beautiful lights of the city at nights. The other side of the monument offers views of the lofty Tuscan mountain ranges in the background. For picnics and camping enthusiasts, this is the place to be. With our wonderful car rental services, we’ll make sure that you can get from place to place with ease. The parties and nightlife at Florence, though not as exotic as in some other areas, offer a regal experience to all the tourists. When you tire of the Tuscan ranges, come downtown and discover the beauty of suburban Florence. Rentalcargroup.com offers car rental in more than 35000 locations, at all major airports and cities and railway stations. Below on this page you see a map with all the car rental companies we work with in Florence. 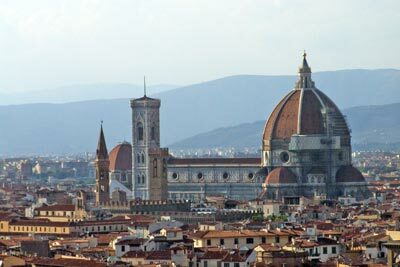 Driving around in the city of Florence with a rental car can be a hassle but not impossible. Its a good way to move around but we advise to have a look at the local traffic rules as they may vary with what you are used to. Take in mind that in rush hour traffic can be pretty dense and it can take longer before you reach your destination. Last month, the average car rental length in Florence was 6 days. The average rental car length in Florence is 3 days. The most booked rental car type currently in Florence is ECONOMY cars. Last year, the most booked rental car type in Florence were INTERMEDIATE cars. How much does it cost to rent a car in Florence? Last month, the average car rental price was 203 USD. Last year, how much did it cost to rent a car in Florence? Last year, the average car rental price was 134 USD. What is the current average daily price to rent a in Florence? Last month, the average rental price was 36 USD per day. How much did it cost to rent a car in Florence over the past 12 months? Last Year, the average rental price was 42 USD per day. The car rental companies available in Florence are: Alamo, National, Enterprise. See below last 5 customer reviews. Our customers rated Florence Car Rental with an average of 0.00 based on 0 ratings.